1st Annual Christmas Tree Lighting Wednesday December 5th at Veteran’s Memorial Park, Holiday Island Arkansas. Octoberfest…Fun for the whole family. Music, Candy, Games, Inflatables and More! 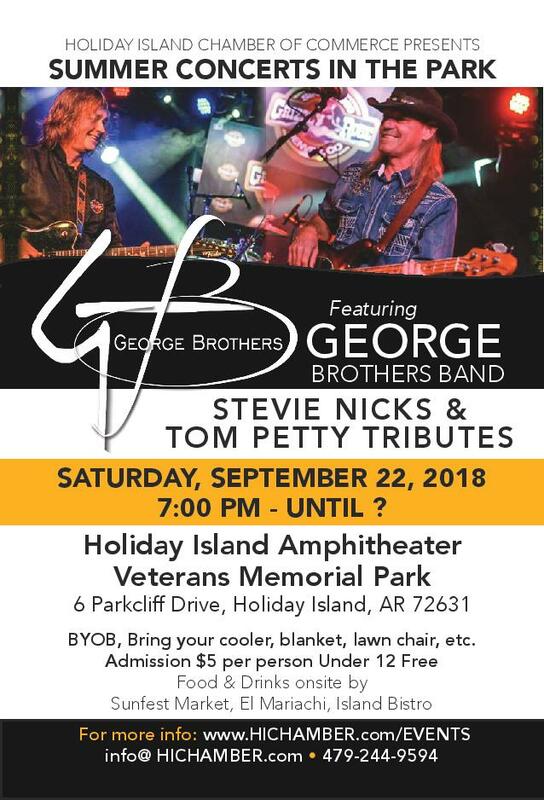 Regretfully, we had to cancel the George Brothers Concert scheduled for Saturday Sept. 22 at the Holiday Island Veterans Memorial due to highly expected inclement weather. We will reschedule the concert when weather and conditions permit, hopefully soon. Also, the will resume our Summer Concert Series next year following our 6th Annual Jeep Fest on the 2nd weekend in May. Food by SunFest Market starting at 7 p.m.
Bring coolers, blanket, and lawn chairs! Admission is $5 per person at the door. Kids under 12 get in free! Local opener starts at 7:00pm, Cate Brothers Band comes on at 8:00pm! Join us for our Holiday Island Chamber of Commerce monthly meeting. Come join us for another fun-filled Jeep Fest at Holiday Island! Looking forward to seeing you at Jeep Fest 2018. Please share with your friends, family, co-workers, and even people you don't like. Thank you! Join us Thursday, March 8 1:00 p.m. - 4:00 p.m. for The Island Bistro's grand opening! We are pleased to announce that the Holiday Island Chamber of Commerce is hosting a Christmas Piano Music Concert by Joel Sebag on Wednesday, December 20 at the Holiday Island Clubhouse at 6:00 p.m.
Joel is a well know concert pianist, and he plays locally, regionally, and abroad. There will hot cider, coffee, wine and finger foods served. Other food and beverages can be purchased in the H I Restaurant. Joel will have his CD's available for sale. The concert is free, but proceeds and donations go to orphans in the Philippines. Please join us for a great Christmas celebration and please spread the word on Facebook! The Holiday Island Chamber of Commerce invites you to a concert Sunday, July 16, 3:00 p.m. t the Auditorium in Eureka Springs. Ticket are $10, and they are available at the Wolf Wellness Center and Sunfest. Come out and support our local talent. Join us for Jeep Fest 2017! Farmer's Market dinner, live music, registration, t-shirt & sticker sale, and Jeep Fest trophies & awards showcased. Live radio coverage & music, food & drinks, trophies, cash prizes, vendorS, jeep parade, andoff-roading at nearby Wheelin World. How did you learn about Jeep Fest? What brings you to Jeep Fest? Thank you for registering for Jeep Fest 2016! Registering online just saved you time at the event! Bring yourself and your Jeep at the times above. You will pay $25 for registration at the Farmer's Market event on Friday or at Jeep Fest on Saturday. Register online to save time at the event. Bring yourself and your Jeep at the times above. You will pay $25 for registration at the Farmer's Market event on Friday or at Jeep Fest on Saturday. Holiday Island, Arkansas - Join us for Friday Farmer's Market! Join as at our next Chamber meeting to discuss our agenda and plan for upcoming events. Come and enjoy a social gathering of new and old Chamber Members, while enjoying wine, hors d' oeuvres and entertainment. Get updates on current and planned HICC events. Hear about exciting future events and ways HICC is giving you the most for your membership. Current HICC Board members will be on hand to greet our guests and answer questions about being a member of HICC. Everyone is welcome. See you there!